Derreck spent his youth in Uganda in a riot of pageantry and fragrance. His mother garlanded the house in colorful fabrics she would orchestrate into wedding gowns; his father conjured vats of bubbling oils, fats and perfumes into bars of soap. This enchanted life disintegrated when Uganda collapsed into civil war. Derreck was only ten years old when he witnessed the indiscriminate and systematic killing of neighbors by ruthless rebels and was scared witless when his father was kidnapped and feared dead. Not long after his father’s safe return, the family fled the chaos in Uganda for a refugee camp in Kenya. Derrick’s life was transformed at the age of 22 when CARE sponsored him on a journey to America, where he eventually earned a Master’s Degree from the prestigious Fletcher School at Tufts University. 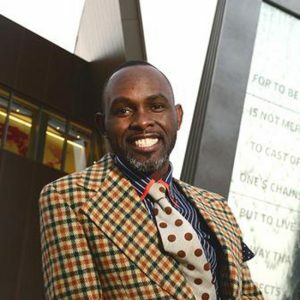 For the past 20 years, he has woven a dynamic quilt of professional experiences: he has been an entrepreneur (Global Soap Project), a professor (Beulah Heights Bible College), a nonprofit leader (CARE, Amnesty International and American Friends Service Committee) and last year was recruited to be the CEO of the National Center for Civil and Human Rights. 1. Business: Employers will be invited to bring their employees to the Center to learn that hate is destructive to the bottom line; it is a distraction from the focus of the business. 2. Academics: Students at all levels of scholarship will be shown what it means to be a good citizen. One aspiration is to create a near universal awareness among Atlanta college freshman that John Lewis was only 19 years old when he first embraced the civil rights movement. Every child will have the opportunity to hear a counter-narrative combatting the hate speech that threatens to poison our future. 3. Faith: Religious leaders of all persuasions will be reminded that the civil rights movement was fueled by people of faith who understood the inequities effect on people’s lives. Clergy will be reconnected to the manifesto of human rights and encouraged to use pulpits to advocate for positive societal change. Derreck’s goal is to empower clergy to better promote social justice. 4. Government: Derrick envisions working with metro Atlanta area police departments to help elevate the discussion around diversity and inclusion through the lens of the Center’s narrative of social justice. Derreck has come a long way since serving as a manikin for his mother’s flower girl dresses. He built a successful business that now donates 10 million bars of soap each year to people who lack access to this basic necessity. He is a sought after public speaker (Check out his TEDx Charleston talk), and his shelves are starting to fill with awards (2011 CNN HEROES, the Maxx Entrepreneurship award, the Refugee Services Award, Certificate of Congressional Recognition and an Honorary Doctorate in Humanities awarded to him by Oglethorpe University). He is a bold dresser whose passion for fashion expresses itself in colorful ties and pocket squares matched with patterned jackets and shirts. He maintains his manikin physique through weekly trips to the salsa dance floor. We expect spectacular choreography and a dynamic future for this refugee-turned-visionary leader. I don’t know where my first name originated; Kayongo is my father’s name. I was named during a Baptism in the Anglican Church. A diplomat at the UN. A thought leader in the area of diversity and inclusion. I would be a better husband and father. Being a disrupter is demanding on family and I wish I had another go at it to develop balance. I am crippled by it. I am not reading anything right now. Rather I am listening to my cultures’ old stories of finding falsehoods to uncover my true inner truth. It’s an old technique that requires one to listen all the imbalances around them so as to self correct. I am LISTENING and going self-retreat. Otherwise I would love to read Malala’s book. Sycelles Island in the middle of the Indian Ocean and then once in a while London for fashion week! Making the Center for Civil and Human Rights the focus of everyone aspect of life in the State of Georgia so the civil and human rights history becomes vogue, meaningful and relevant to today’s struggles for social justice. My son and daughter are the two most impressive people I closely relate to. I love to be clad in the most beautifully coordinated fashion pieces. Clothing! My mother. She and I would love the fashion and it would remind us from whence we’ve come! Michael Jackson!!!! OMG….Yes give me Michael any day.